The Munster Senior & Master’s Track and Field Championships were held in Castleisland Co. Kerry on ‘An Riocht’ AC.’s recently renovated track. The day proved to be a successful day for the club where we had two athletes crowned Munster Champions, a clean sweep of the medals in the O35 400m and several season and personal best performances. Eight athletes travelled down on the day to sport the Green and Gold jersey and Martin Flynn kindly made the trip to support these athletes. The day began with the 100m where we had a Munster Champion in the O35 category with Kate Harrison. Kate ran a PB to claim the gold in a time of 14:06 and was followed closely by Ber Spillane in the silver medal position in a time of 14:94. Bridget Gleeson followed in the 800m where she won her age category and took a second off her PB to finish in a time of 2:46. This superb performance was replicated in the 200m where Bridget was 2nd in her age category in a time of 33:97. Our two medallists in the 100m also featured in the 200m where Kate Harrison won this event in 29.40 followed by Ber Spillane in second position in a time of 31.65. Prior to this, Sarah Healy competed in the 200m Senior category and ran 29:34. These three athletes also competed in the 400m event later in the day. Sarah Healy ran a 65.87 400m in the competitive Senior competition and Kate Harrison, Ber Spillane and Edel Delaney claimed a clean sweep in the O35 400m. Sharon Cantwell was our second representative in the middle distances and she ran a season’s best performance with a time of 5:44. 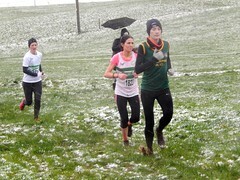 Sharon and Ber had a busy weekend having taken part in the Dingle adventure race prior to this competition and credit must be made for the great performances for both athletes. The final event on the track was the 4x100m for Senior and Master clubs. Moyne AC had a team competing in both categories. Sharon Cantwell and Sarah Healy were joined by Katie Bergin and Lorraine Healy in the senior relay where they placed 2nd in a time of 56 seconds. The Master team comprised of Kate Harrison, Bridget Gleeson, Edel Delaney and Ber Spillane where they finished in 2nd postion. The club hosted the Athletic Finals of the County Community Games on Sunday for the very first time and despite this being our maiden foray into this level of competition we were delighted with the response. We had such a variety of people doing amazing work throughout the day, willingly giving their time and help, that it would be impossible to name everyone without leaving someone out but you know who you are and we are deeply indebted to you for your support. Our thanks must also go to our landowners for allowing us to use their fields for parking, which helped alleviate the traffic on the road. With over 500 children taking part it was a big undertaking for the club and our congratulations to each and every child that competed – you did your mentors and parishes proud. Congratulations also to the 21 children from our own parish who competed bringing back gold, silver, bronze and pewter medals to Moyne & Templetuohy. The lotto spot prizes were won by Donie Troy, Kate Harrison and Sharon Kiely. Congratulations to the three winners and thanks to everyone for their continued support. This event will take place over two days ; Saturday 16th June and Sunday 17th June. Full event timetable can be accessed on the Tipperary website. This event is one not to be missed and a big day in all Moyne AC’s athlete’s diary. This evening of competition is a celebration of the clubs achievements in the last 70 years. The evening’s proceedings include a men’s mile and a female 800m with cash prizes for the winner of both events and a substantial €300 bonus if 4 minutes and 2:05 minutes are broken in the men’s mile and female 800m. This opportunity is not to be missed; contact Moyne AC through Facebook, phone or e-mail if interested in participating or helping out on the night.